Creak. Thunk. Creak. Thunk. Hear that? It’s the sound of the bandwagon lumbering by, pausing just long enough for me to vault myself over the backboard. I never wore I wouldn’t write about the anniversary of John F. Kennedy’s murder, I was only hoping I wouldn’t need to fall back on it, sprawled across my keyboard in desperation. My brain’s been pretty empty for the past few weeks. Not to say there aren’t any signs of life — but it’s rarely life as we know it. Let’s see. I had the worst job interview ever. I stayed home from a concert I really wanted to go to, and a good friend had given me a ticket for. $45. Gratis. Sympathy for my financial condition. He’s still mad at me. But I really did have the job interview the next morning. Yes, that one. The worst one ever. Meanwhile, my mental state and general location on the feeling funky (in a bad way) scale have been pretty poor. Kinda like the cookie crumbs in the bottom of the package. Do I lick my finger and try to dip them out? Am I that desperate? What the heck does that mean? It sounded good in the moment. Anyway, it seems the only place you can go right now and not stare into JFK’s eyes is the bathroom or the laundry room. I know. I visit both frequently. The cats had put up a picture of JFK with a photo-shopped cat on his lap, downstairs between the washer and dryer. I told them to knock it off and I tore down the picture. “Do you remember where you were/what you were doing when you heard Kennedy was assassinated?” It’s been the question of a generation, and more. Some people say that today’s equivalent was the cowardly terrorist attacks on Sept. 11, 2001, and that day would become the landmark spot on the calendar for today’s generation. For people who don’t recall the shocking murder of a charismatic President, the terrorist attacks can hold that painful consequence. It’s probably also that a lot of young people are tired of hearing about the day that changed a nation — changed the world — that occurred years before their birth. We’re far more jadded and impervious to senseless violence. Who knows? Let’s see what happens in 39 years on Sept. 11. Send me a postcard, because it’s likely I won’t be hanging around. My daughter will be. In a few years, she’ll hear about Sept. 11 and grasp its significance. Likely before she hears about JFK. I was a tweener, of sorts. I was 5 years old when the President was assassinated. Old enough to remember the grief, but too young to understand the pain. I still wasn’t in school yet (that would begin with first grade). I was home, with my Mother — who stayed home out of necessity, to care for a disabled child. 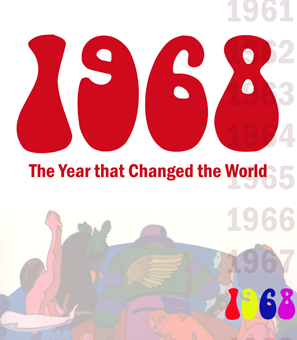 The year that hit home for me was 1968. Dr. King, in April. My Mother’s tears the morning after the California primary over a Kennedy brother — a peace candidate — struck down. The sadness and senselessness of it all. How it undermined my faith — my confidence — in our society to do the next right thing. The Democratic Convention. The riots. Vietnam. Lyndon Johnson. I dunno, for people like me, 1968 was the game-changer. We grew up in the shadow of all that transpired that year, and it continues to affect many of us even this day.